The following is a personal story about military contamination submitted to Civilian Exposure and published as part of our new series: “Contamination Chronicles: Personal Stories of Exposure”. If you would like to submit your story, you may fill out our form here or send directly via email to share-@-civilianexposure.org. My husband was stationed at Camp Lejeune in early 1986 for several months of school after boot camp. He left the Marine Corps in 1991. He now has severe GERD and recurring pneumonia. In 1994, we lost our first baby. I was 24 weeks pregnant and went into labor. No matter what they tried, they couldn’t stop it. Baby “K” was born weighing less than 2 pounds. I had polyhydraminous, with five times the normal amount of amniotic fluid when I delivered her. She passed away a week later due to a perforated bowel. My second child “B” was born 5 weeks early with congenital heart disease. To make this short, she had to have her pulmonary valve replaced. She also had to have a hole in her heart closed in 8th grade. She now has a prolonged QT interval. My third child “R” has ADHD. He has behavioral problems plus has trouble keeping and making friends. I didn’t live on the base. All of these problems could be caused by the contamination of the water at Camp Lejeune, but nobody wants to listen. It would be nice if the government would take care of my husband’s daughter’s and son’s health costs for the rest of their lives. For years, I tried to figure out what I might have done to cause these problems with my pregnancies and health issues of my children. 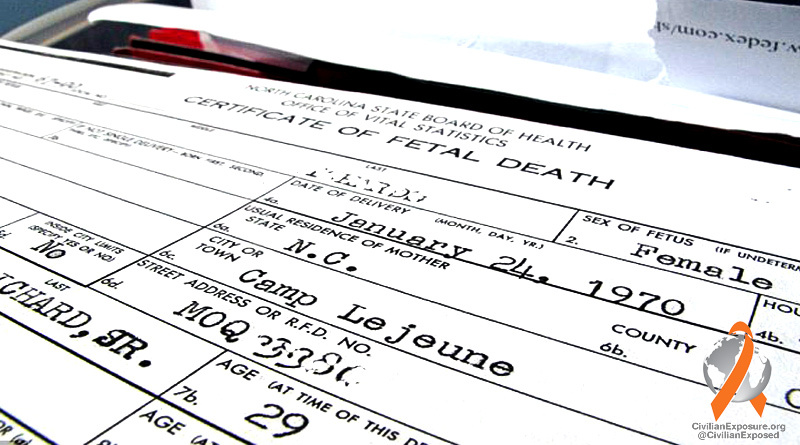 When we received the first letter from the Marine Corps about the Camp Lejeune water contamination, I knew that it had to be the cause, even years later. I have spoken to people at the CDC and they said that there is a very small chance that these issues could have been caused by the contamination, but it was not very likely. If it wasn’t the cause, I can live with that. But if it was, there should be some kind of settlement to take care of at least all of the future medical expenses for my husband, daughter and son. My husband is humble and doesn’t want to do anything about it. He said that when he signed up, he agreed to give this country everything, including his own life if necessary. Thank you for listening and giving me the opportunity to share our story. We would be curious to know – Who did you speak with exactly at the CDC? Further, we’d like to know what (if anything) they cited to back that claim up? Also, I understand where you’re coming from regarding your husband. It is something that I hear quite a bit. Many do not want to go against an institution/brotherhood to which they dedicated themselves. That said, he has to understand that this isn’t about the Corps, it’s about the bureaucracy that compromised the honor and foundations of what that brotherhood and institution means by a) allowing contamination to go on unchecked for so many years, b) not accepting responsibility for the health impacts and results of that contamination, and c) not standing up to provide adequate justice and care for veterans impacted. Note from the Editor: The author currently resides in Massachusetts. The account/editorial is verbatim from the author without edit, with only the omission of their name to preserve anonymity.